"I have always wanted to try lentils but don't know much about them. This ... read full review"
Lentils are legumes that generally have a rich nutty flavor. They are grown in pods, which contain one or two seeds each. There are many varieties that are classified as large or small and are round, oval or heart shaped. They are generally no more than a 1/4 of an inch in diameter. Lentils cook much faster than dried beans and do not require soaking. Lentil seeds are sold whole or split and some have had the hulls removed. The green and brown lentils, which hold their shape best after cooking, are the most common types used in the United States. Red lentils are also popular but they do not hold their shape as well when cooked. Lentils have good nutritional value, containing dietary fiber, B-vitamins, protein, and hardly any calories. Lentils are generally used in soups and stews. 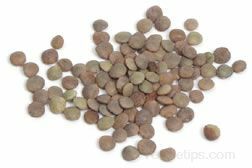 Green and brown lentils hold their shape fairly well if not overcooked and can be added to salads and other dishes. The varieties that are soft after cooking are used mainly to thicken stews and soups or are made into purees. Lentils are dried and are available throughout the year. The more common varieties are found in most food stores but some varieties are only available in Ethnic markets and specialty stores. Lentils are sold prepackaged in boxes or bags, and they are also sold in bulk form. When purchasing prepackaged lentils be sure the packaging has not been damaged and that there is no sign of moisture damage. 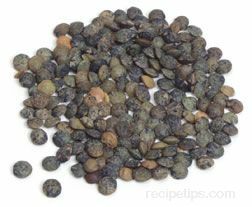 Lentils should be fairly uniform in size and color, and they should be free of insect damage whether purchasing bulk or prepackaged. Insect damage is recognized by very small pinholes in the lentils. They should not be cracked or broken pieces. When buying in bulk, be sure that the lentil bins are covered and that the product is turned over often enough to ensure freshness. Lentils can be stored indefinitely but after a year their color will begin to fade and they will become dryer and take longer to cook. Also, keep in mind that it is uncertain how old the lentils are when they are purchased so it is a good idea to only store lentils for six months. Do not mix newly purchased lentils in with the lentils you have stored at home because the lentils you have been storing will be dryer than the ones you just purchased. Different degrees of dryness will cause the lentils to cook unevenly. Store in a sealable bag or airtight container in a cool dry area out of the direct sunlight. Cooked lentils can be stored in an airtight container and refrigerated for 4 to 5 days. 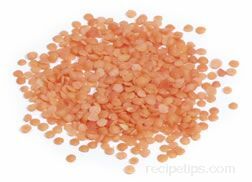 Cooked lentils can also be stored in the freezer for up to six months, but freezing them may affect their texture when reheated. 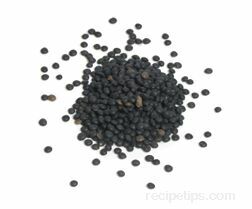 A very small black colored lentil most commonly used in Indian food dishes. Black lentils can be found whole, split, and with skins removed. The lentils are a creamy color when the skins are removed. Whole or split lentils have a strong earthy flavor when the skins are left on but with the skins removed their flavor is fairly bland. The standard light brown lentil that you would find most readily available. Brown Lentils are plumper but smaller than green lentils with a more earthy flavor. They hold their shape well but if overcooked they can become mushy. A delicate peppery flavored lentils originating from Puy in France that are now grown in North America and Italy. They are approximately 3/16 inch in size with an outer skin that is deep green with dark speckles and an interior that is yellow. They retain a firm texture after cooking, which makes them a good addition in salads and dishes where the whole bean is desired. They may take a little longer to cook. Also known as Le Puy lentils. A very flavorful lentil that holds its shape well after cooking, making it a good addition to salads and other dishes that need additional texture. It is flat and approximately 1/4 inch in size. A very small split lentil most commonly used in Middle Eastern or Indian food dishes. They are generally found hulled and split, revealing their orange coloring. Orange lentils cook up quickly as a result of being small and split. They cook up fairly soft so they work well to thicken soups and to make purees. Red lentils cook up quickly but become soft and do not hold their shape well. They are best used to thicken a dish or in purees. They are most commonly used in Middle Eastern or Indian food dishes. Traditionally, the unhulled (skins on) red lentil, known as the brown massor, and the hulled (skin removed) red lentil, known as the massoor dal is most common for Indian dishes. Unhulled, they are brown with a red tint and about 1/8 inch in size. With skin removed the seed is orangish red in color and about 1/16 inch in size. Lentils require only a few simple steps to prepare them for cooking. Follow the preparation steps below. 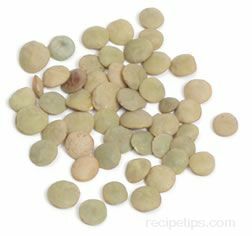 Spread lentils out in a single layer on a white kitchen towel or a light colored work surface. 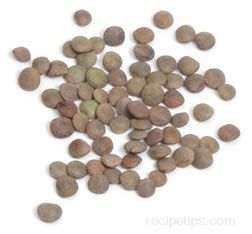 Check for and discard any dirt, tiny stones, and damaged lentils. After checking through the lentils, place them in a strainer and rinse thoroughly under cold water. They are ready to cook after rinsing. The lentils do not require soaking before cooking. Lentils must not be overcooked or they will become soft and mushy. Different varieties require different cooking times. Use 1 1/2 cups of water or broth to 1 cup of lentils. Add water or broth to a saucepan and if desired add flavorings, such as herbs, garlic, and onions. Do not add salt until the lentils are cooked because the salt will toughen them if added at the beginning of the cooking time. Bring water or broth to a boil and add the lentils. Boil for 2 or 3 minutes and then reduce heat to a simmer. Cook until tender. Cook green and brown lentils for approximately 45 minutes and red lentils for 25 minutes. Be sure to start taste testing the lentils for desired tenderness 10 to 15 minutes before the end of the cooking time. Do not overcook or they will become mushy. If adding lentils to a salad or if you desire a firmer textured lentil in your soup or stew, only cook them until they have a tender but firm texture. If cooking to use in a puree, cook until soft. Cooking times will also vary depending on the age of the lentils, which affects their moisture content. When using packaged lentils, be sure to check for tenderness before the end of the suggested cooking time. Most suggested cooking times are longer than necessary and could cause the lentils to become mushy. "I have always wanted to try lentils but don't know much about them. This article was very helpful. I think I will try them in a soup. I found several recipes on this site for soup calling for lentils so I might give one of them a try." "I guess Wikipedia doesn't know everything! I know they have great nutritional value and was wondering how to cook them so I could add to some of my soup recipes. This article was very helpful. Thanks!" "wikipedia told me that lentils are planets and that is all so i do not know who you are trying to fool with you "people eat it" thing"